1. According to the 2010 U.S. Census, 49% of children in VT live in two parent households (with their married, biological parents) which ranks VT 4th of New England states. What NE states trail VT? 2. What U.S. States has the lowest and highest percentages? The West Wall project is officially complete. 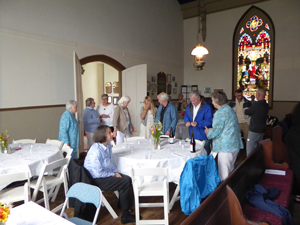 Final vacuuming, a pew repair, and re-installation of the kerosene lanterns were all done just in time for the Annual Meeting on June 28th. The Hall looks great and unchanged. The supreme compliment and number one comment? " It looks the same, what did you do with all that money?" To help answer that question we've posted a 13 minute video on YouTube that chronicles the project from the first study in late 2007 to the final clean up. It's available at this link - West Wall Project video or via our website. It's meant to provide context and convey the complexity of the project, much of which is now invisible, buried in the walls and attic. Take a look. The project took about 10 months and cost about $130,000. One of the other FAQs we've received is what are you going to do with the rest of the funds you raised? I will be working with the Board to earmark some for the Stained Glass Window Fund and we will use the rest for other projects and programs. We've just signed a contract to replace the asphalt roof over the chancel with a metal roof. The work will be done this Fall. Many deserve credit for pulling this off and we acknowledge them in the video. I would like to make special note in this space of the selfless work of the Society's Board members, past and present, who have guided your Society into one of the most effective and reputable organizations of its kind in the State. 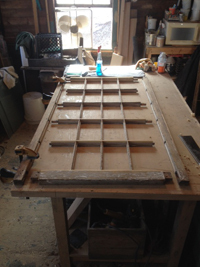 To paraphrase our General Contractor and Timber Framer, Jan Lewandoski, "You guys really have your act together. Your ability to get people out to support the work is remarkable. I tell everyone I work with about you. You have the reputation of getting things done." This reputation extends to the VT Div. 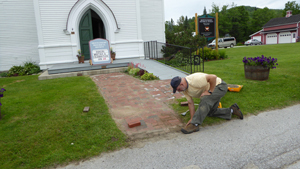 for Historic Preservation, the Preservation Trust of VT, and the Vermont Historical Society. August 22 at 7:00 p.m. Join us and the Friends of the Montgomery Library for the Woods Tea Company at Pratt Hall. This local favorite features a blend of traditional and vintage musical styles which pleases the ear and inspires a smile. The first weekend in October we will co-host and present a program on Montgomery history at Pratt Hall as part of the Wild and Scenic Rivers series. The Montgomery Conservation Commission and Covered Bridges Garden Club will co-host too. MHS will present the Trout River and Montgomery History focusing on how the Trout River influenced the Town (think covered bridges). The Society supported the WSR designation effort and provided input on what are termed ORVs, Outstandingly Remarkable Values - which in this case are cultural influences. Details will follow. Our bylaws require us to have an Annual Meeting every June to provide a "State of the Society" report and elect Board members and officers. This year's was June 28th. Nearly sixty members and their guests were treated to Dennis Deuso's bar-b-q pork and roast beef, and Sam Murphy's beans and salads in the reconfigured Pratt Hall. 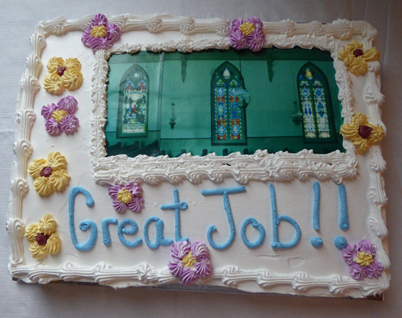 We celebrated the project's completion with cake. The State of our Society is very good. We are strong financially, meet our mission goals, and have fun doing it. The Board would like to see even better membership / participation and looks forward to offering more programs now that our major building projects are completed. 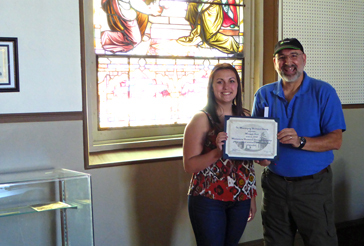 This year's scholarship winner was Miranda Ovitt. Beside the glory Miranda received $500, a certificate, and a copy of the Montgomery Town History, which Jo Anne Bennett autographed. Miranda has already started at Johnson State College and will continue in the fall and is studying math. Congratulations and good luck to Miranda and her parents! Thanks also to our selection committee, Rita Kalsmith, Patty Perl, and Patty Hathaway. 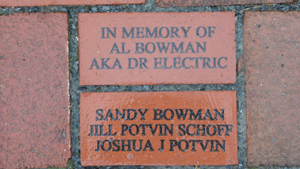 People continue to express interest in the engraved brick pavers, which we will continue to sell as long as there is demand (we can always expand the walkway!). 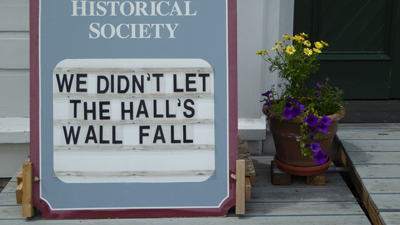 They also can be purchased on line at our store page, History For Sale or by calling Board member Pat Farmer. 1. Rhode Island 41% and Maine 45%. The remaining NE states are 51% to 53%. 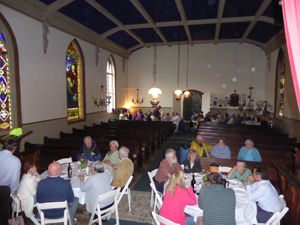 The Society's annual program was at the Old Center Cemetery and was well attended. Our speaker was Scott Perry, who spoke about Bill Branthoover and the role he played to re-establish the Town's observance. 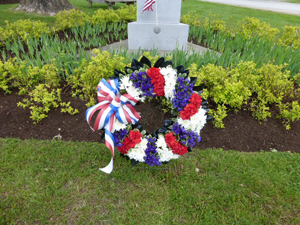 Bill, a veteran and longtime Society Board member, was laid to rest in the newer part of the cemetery this past fall. Our thanks to our readers Steve Hays and Sue Wilson, and American Legion Post 42 (Enosburg) for supporting our annual observance and to Parma Jewett for donuts, and drinks. Last year's membership drive just missed our annual goal of 200 memberships. We are hoping to rebound and so far are on track but we can't let up. Reminder letters will be going out soon. Please join or rejoin us... every member matters! 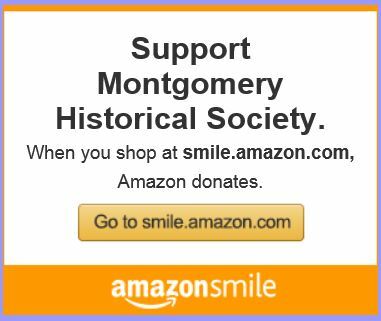 Since the last newsletter the MHS has become a registered non-profit with the Amazon Smile program. Now you can designate us to receive a donation from Amazon anytime you purchase something. Amazon will donate half of one percent of the purchase price to the MHS. This works out to 50 cents for every $100 spent. This costs you nothing. Amazon donates it from a foundation funded by its profits and vendor contributions. You can also enter via the link below or on our homepage. Sue Wilson transferred the reigns of the MHS Treasury to Mark Baddorf on June 28th. Sue will remain on the Board and will help with the transition. Our thanks to Sue for her many years of financial management. She deserves the break!! And thank you to Mark for volunteering to take on these responsibilities. Two new Board members were appointed by the Board and then elected at the Annual Meeting. Welcome to Bob Cummins and Andre LaBier. Bob and his wife, Becca, founded and have run the Celebration of Expressive Arts (CEA) for several years in Montgomery. They live on Nutting Rd. Andre and his wife, Rosalia, live off Notch Rd and have been long time Society members. Andre is a retired U.S. Marshal and car enthusiast. Welcome aboard! We have one remaining vacancy on the Board. Please let us know if you want to join the team. Our thanks to Marsha Phillips for donating three different 100+ year old histories of Franklin county to the small MHS bookshelf / library. Thanks to Sandy Bowman for donating her copies of newspaper articles after the 1985 tower/clock/bell restoration. July 1817: Congregational Society formed - first organized religious group in Montgomery. August 1897: Percival Shangraw born in Montgomery. Lived and went to school on West Hill. Chief Justice of the Vermont Supreme Court 1972-1974. September 1802: Montgpomerians cast their first votes for State office holders. We were saddened to learm of the passing of former MHS Board member, Eric Bataille, at the end of April. Eric served as a trustee from 1997 to 2005 and was the original organizer of our annual Art Show and Sale. Our heartfelt condolences to his wife, Anne, and their entire family. Still no official word from the National Park Service (NPS) regarding the National Register of Historic Places designation for this Town landmark, but after State approval it's just a matter of time. The Montgomery Town Association continues to meet to keep the property up and explore ideas for re-purposing. Please come to a meeting or share your thoughts with any MTA Board member. The Board is comprised of Marijke Dollois, Sue Wilson, Nick Barletta, and Everett McGinley. We will be purchasing the plaque once the NPS makes it official.